Sharjah Art Foundation is pleased to announce that internationally-acclaimed dance studio Company Wayne McGregor will inhabit Rain Room Sharjah from 14 to 16 February 2019, continuing nearly a decade of collaboration between choreographer Wayne McGregor, CBE and Rain Room’s creators, Random International. The dancers will perform continuously evolving interventions in the rain to the musical score Rainlight by contemporary composer Max Richter. Choreographed by Wayne McGregor, this performance premiered at Rain Room in The Curve, Barbican, London in 2012. The performances will be presented over three days. Company Wayne McGregor dancers Rebecca Bassett-Graham, Camille Bracher, Jordan James Bridge, Benjamin Holloway, Daniela Neugebauer, Jacob O’Connell and Jessica Wright will perform the dancer interventions in Sharjah. The company has toured in over 50 countries, performing more than 30 experimental choreographic works by McGregor. To learn more and purchase tickets, visit sharjahart.org. 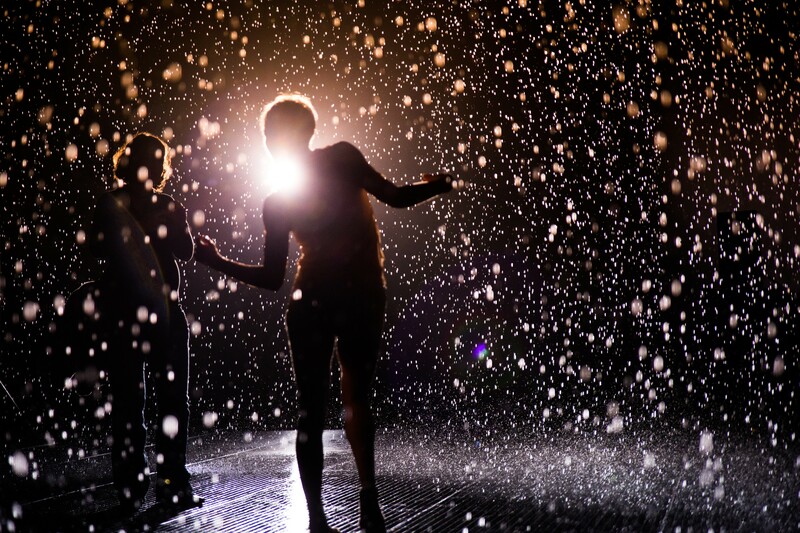 Each ticket reserves a 15-minute visit to Rain Room and the ongoing performances. Random International’s immersive installation Rain Room (2012) invites you to walk through a downpour of continuous rain without getting wet. The responsive environment follows visitors as they navigate the darkened underground space, preventing the rain from falling directly above any detected human presence. This site-specific installation uses 2,500 litres of self-cleaning recycled water, which is controlled through a system of networked 3D tracking cameras. The work explores how humankind's relationships to one another and to nature are increasingly mediated through intangible technologies. Founded in 2005, Random International is an art group based in London and Berlin. Their work, which includes sculpture, performance and large-scale architectural installation, explores the human condition in an increasingly mechanised world through emotional yet physically intense experiences. Sharjah’s Rain Room marks the Middle East premiere and the first permanent installation of this project by Random International. The work has previously been on view at the Barbican, London (2012); MoMA, New York (2013); Yuz Museum, Shanghai (2015) and LACMA, Los Angeles (2015–2017). Opened in May 2018, Rain Room is part of the Sharjah Art Foundation Collection and the first of a series of artist-designed permanent spaces. McGregor is Artistic Director of Studio Wayne McGregor, founded in 1993, which encompasses Company Wayne McGregor and a host of education, research, artist development and community engagement initiatives, including FreeSpace and QuestLab Network. Among his more than 30 experimental choreographic works for Company Wayne McGregor are Autobiography (2017), +/- Human (2016), Tree of Codes (2015), Atomos (2013), UNDANCE (2011) and FAR (2010). McGregor is also Resident Choreographer of The Royal Ballet, London, and he is regularly commissioned to create choreography for international ballet companies, films (Harry Potter, Fantastic Beasts, Mary Queen of Scots), music videos (Radiohead, Chemical Brothers), fashion shows (Gareth Pugh, London Fashion Week 2017), campaigns (everyBODY for Selfridges) and television (Brit Awards).